Is there a better alternative to QuickShift? Is QuickShift really the best app in File Management category? Will QuickShift work good on macOS 10.13.4? 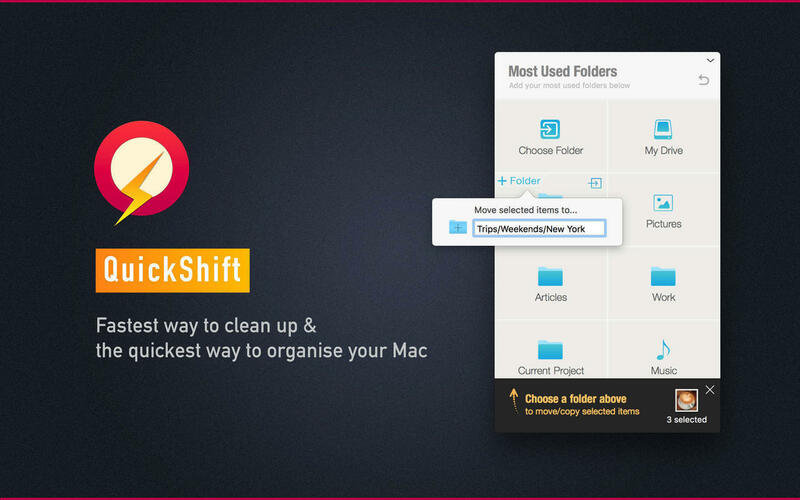 QuickShift is the fastest way to cleanup and the quickest way to organise your Mac. So now every time you see clutter build up, you don't have to worry: use QuickShift to handle it. QuickShift needs a review. Be the first to review this app and get the discussion started! QuickShift needs a rating. Be the first to rate this app and get the discussion started! Drag-and-Drop + QuickShift Power Features: QuickShift provides instant access to your most used folders from everywhere - through menu bar, HotKey (Command +1), and Services menu. Just drag-and-drop files to QuickShift, and then move or copy with the power features of QuickShift. Creating folders, subfolders, and hierarchies to organise, moving files and folders to locations deep in hierarchy are all handled in a jiffy. Power Move or Copy: We create lots of folders and hierarchies while cleaning up clutter and organising. Once you drag-and-drop files to QuickShift, use Power Move to create subfolders and even complex hierarchies in no time and no effort. Deep Move or Copy: The more you organise, the deeper the file hierarchy. And then it becomes a pain to access. With Deep Move or copy, you can quickly move or copy to any folder that is far to access. Auto-Detect External Drives: QuickShift will auto detect external drives that you connect and add it to your most used folders grid. This gives you instant access to copy content from the computer to your drive. Hotkey Access: Press Command + 1 to launch QuickShift from anywhere! 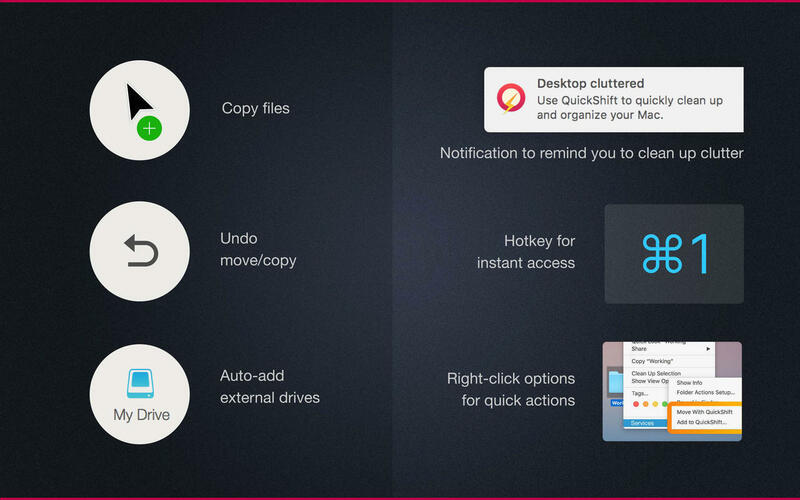 Alert on Clutter: When your desktop gets cluttered, QuickShift automatically sends you a notification to clean up. 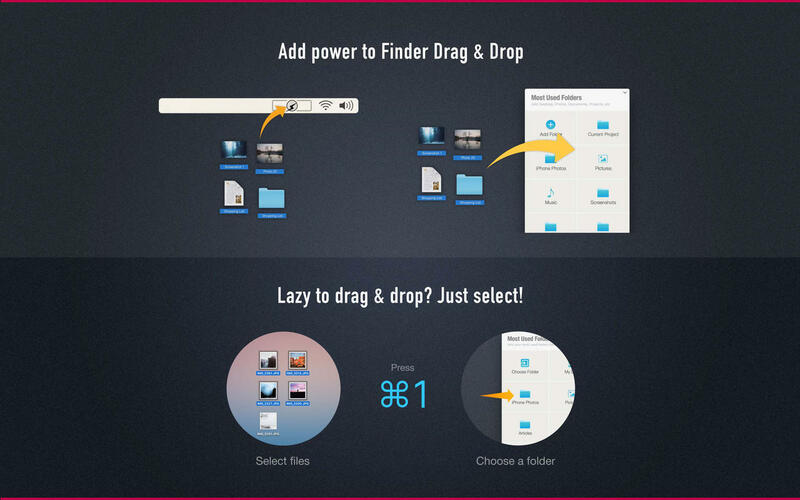 Undo: Unlike similar applications, QuickShift will let you undo moving or copying of files.